We awoke early this morning, with the alarm going off at 5am, then after packing the last few items into the Wolf, Some of my family and friends, including Nick, Amy and Oliver, came to wave us off. We then headed off from Woldingham in Surrey to Folkestone, via a quick stop to say goodbye to mine and Rowans grandmother at a brief meet on a roundabout off the M20! 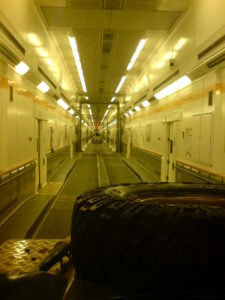 The Channel tunnel went smoothly, albeit with a search from Customs and security officials. 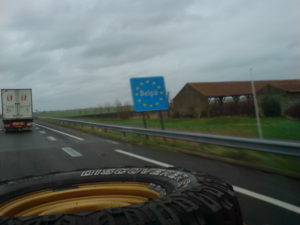 On arriving in France we stopped at a Carrefour Cite L’Europe for fresh produce and then got back on the road towards Belgium. 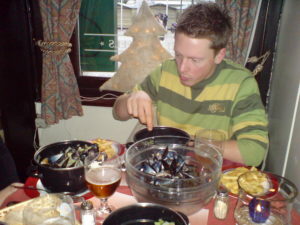 Our first stop in Belgium was Brugge (Bruges), where we stopped for some traditional Mussels and chips (moules frites.) For the non drivers this was washed down with my favorite Belgian export, some fine Belgian beer! 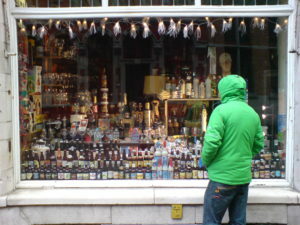 On reflection we should have stocked up on some of these for the trip, but hey, there’s another lesson learnt! After lunch we decided that we were so close to Holland that we might as well add it to our list, so after an hours drive we arrived in Breda, where we camped for the night. The first nights camping was very funny, and we all remarked about how smoothly it was all going. In the morning there were heated shower rooms that we could use, a good thing, as there was a long drive ahead. Meals Eaten — Rubbish Garage Sandwich for Breakfast, Amazing Mussels & Chips for lunch, Average Tomato Soup with Lentils for Dinner.